Company Will Serve as Presenting Sponsor of the Matching Funds Program of the 2016 Regions Tradition Golf Tournament. SouthWest Water Company will serve as the Presenting Sponsor for the Birdies for Charity fundraising program at the May 18-22 2016 Regions Tradition Champion’s Tour golf tournament at Greystone Golf & Country Club in Shelby County, company officials announced today. The program’s goal is to raise one half million dollars or more, to be donated to local charities. SouthWest Water Company is in its second year supporting the program, and first year as the presenting sponsor of the Matching Funds program. The company’s support allows for charities that raise $1,000 or more to receive a percentage match. The top five charities (as determined by which charities generate the most donations) will receive a higher match percentage through the SouthWest Water Company Matching Funds. The exact match percentages will be determined at the conclusion of the program in June 2016. The primary goal of participating organizations in the Birdies for Charity program is to successfully solicit and collect pledges of $.05 or more from the general public and corporate donors for each birdie made by the Champions Tour players during tournament week. Flat donations of $20 or more are also accepted by participating charities. Administrative and promotional costs for the program are paid by the Regions Tradition (excluding individual charity organization mailing/solicitation expense), and 100% of the pledges collected will go to the individual charity that solicited the Birdies for Charity pledge. In 2015, the Birdies for Charity program raised more than $514,000 for charity. 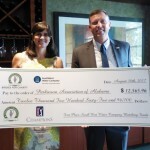 Any 501(c) 3 organization recognized by the IRS may participate in the Regions Tradition’s Birdies for Charity program. In addition, schools and athletic booster programs are encouraged to participate. For more information and to register visit http://www.regionstradition.com/birdies-for-charity.php or call Allie Dunlap at (205) 262-2815. Click here for our letter to participating charities. For information concerning how a charity may participate in the Birdies for Charity program, contact Allie Dunlap at (205) 262-2815.